"The Man Who Talked with Death"
Noted by Dunning as "a poor man's Mysterious Traveler," this spooky series teamed Mysterious Traveler's voice, Maurice Tarplin. 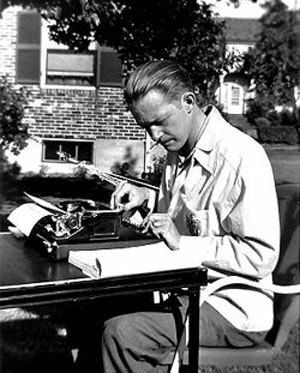 Along with one of its writers, Tarplin had developed his killer pun skills as the Mysterious Traveler, whose creepy intro's made that more famous show tick nervously. Tarplin and Arthur probably felt that a second body of work was worth a try. After all, they might make a killing. 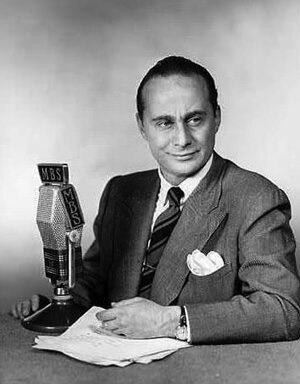 Of course, old time radio was littered with macabre MC's a favorite was Raymond, the insouciant host of Inner Sanctum Mysteries, and who could forget that cackling crone Old Nancy, the "witch of Salem" who hosted the Witch's Tale? Tarplin plays The Strange Doctor Weird as though he had hung with that fine actor Boris Karloff. He appeared on Inner Sanctum Mysteries often in the early 1940s,and Boris Karloff hosted the short-lived Creeps By Night in 1944, as well as making many monstrous appearances on other shows. 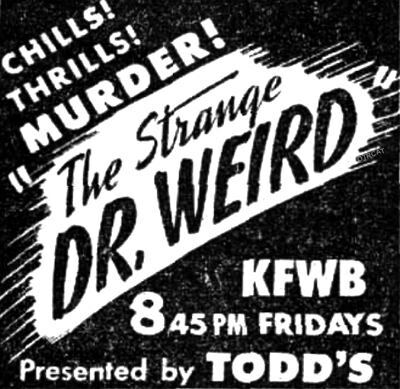 The Strange Dr. Weird's concoctions are stitched together parts of supernatural, bits of gore, innuendoes of dread, organ obligattos and the acting skulls, er, skills of the Mutual regulars. Adam Hats, a name as ironic as some of the plots in this cemetery of thrills, paid the bills for the chills. Mad organ work. Chilling sounds in the night. Echoes of doom. The Doctor is in. "Just look for a house on the other side of the cemetery the house of Dr. Weird." the house of Dr. Weird!" Be the first to comment on "Strange Doctor Weird"